In today’s budding digital economy, many of us often assume social progress is bound to improve at a similar pace as technology. However, the gender gap is causing an even deeper divide than we originally expected. According to the World Economic Forum’s latest Global Gender Gap Report, the gender gap continues to widen as women remain behind in politics, health, education and economics. In fact, recent research predicts that at our current rate of progress, gender parity won’t occur for another 217 years. That sounds frightening, especially given that women earn 80 cents to every dollar men make while only 6 percent of Fortune 500 CEOs are women. But there is still cause for hope. Emerging technologies now democratize access to resources like education and finance, helping improve gender equality at a faster rate than we might have previously thought possible. Not only will this kind of tech advancement be instrumental in closing the gender gap, but it will also help accelerate economic growth and promote innovation for companies across the board. Here are three crucial ways we can utilize emerging technologies to support more economic opportunities for women — and close the gender gap for good. Women often lack the financial resources and infrastructure that men receive in and out of the workforce. Globally, 42 percent of women and girls remain unbanked, meaning that women are less likely to be financially informed and economically independent. Bill and Melinda Gates’ Level One Project aims to fix that problem. It focuses on using blockchain technology to bring the financially disenfranchised, including women in underdeveloped nations, into the traditional banking and digital economies. The project has created a model for a country-level digital financial services system designed to bring the poor into the formal economy. The system uses wireless and simple 2G cell phones to reduce processing costs for users while integrating fraud and security protections. Crucially, this transparent setup gives women in developing nations access to a bank account and the freedom to take charge of their financial futures. Fintech also eases the financial burdens caused by collateral or credit history issues. For example, data can help financial providers assess and help clients in lieu of traditional documentation which many women in developing countries don’t hold. Companies like Kenya’s FarmDrive, Mexico’s Konfío and banking services like M-Pesa are paving the way in this realm. An MIT study identified M-Pesa as particularly effective in assisting female-led households out of poverty. Meanwhile, developing countries are using biometric IDs to introduce financial safeguards for women, like Pakistan’s emerging fintech tools that ensure women receive direct payments to avoid going through male family members. But Fintech’s unique tools can offer women financial autonomy in more ways than one. Blockchain is yet another innovation that allows self-starting women to send and receive direct payments via a digital ledger. In developing countries, the ledger is especially important to lowering barriers to financial inclusion for women. Further, the interface allows for quicker access to funds and transparent recordkeeping of their finances without having to deal with the (sometimes discriminatory) practices of central banks. Unconscious bias causes gender discrimination due to ingrained cultural notions concerning a woman’s role or ability in the workforce. But artificial intelligence is stepping in to conquer these patterns. For instance, the Seattle-based augmented writing company, Textio, uses automated technology to write job listings with gender-neutral phrasing. It helped one of their clients increase female recruits from 18 to 57 percent. Mya Systems, an AI recruitment tool, incorporates AI-based chatbots that interview and evaluate job candidates to ask objective, performance-based questions which could help avoid unconscious bias in the early rounds of hiring. In addition, companies like Ideal are helping to eliminate bias from the hiring and promotion process. Their AI-based software connects to a resume tracking system, screening prior candidates and external databases to source outside candidates for open positions (and current employees for promotions). These tools help reduce bias during the screening process, allowing more women to take that crucial step towards a face-to-face interview. As automated technology disrupts all industries, more and more people are getting pushed out of jobs. Women are no exception. At the same time, however, automated and intelligent technologies are creating new educational opportunities for self-starting women. According to a recent PwC report, using intelligent tech like big data creates strategic support systems — helping women advance economically. These technologies create career advantages, lowering the costs of starting new businesses and also providing more flexibility during working hours. 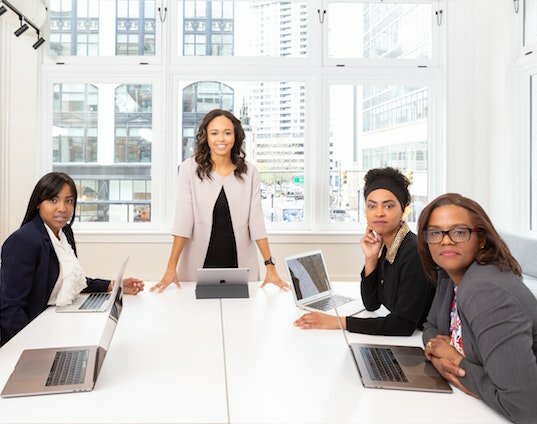 Big data solutions and cloud computing innovations offer unique opportunities to connect working women in any field to educational opportunities with other industry professionals. Big data analytics help educate women in their fields, providing predictive analysis on consumer insights, real-time data and trends so that they can be on the forefront of emerging talent. EY’s Analytics and AI Academy is one such learning program seeking to educate its female employees on big data. Companies use big data analytics to help organizations close the pay gap, too. Data reporting tools help businesses audit salaries that allow them to assess if they’re closing pay disparity on a regular basis. When used transparently, the technology can give women access to data that clarifies if they’re earning equal pay. Gapsquare, for instance, uses machine learning and cloud-based software so companies can match finance data with HR data in systems like payroll. The tool is already implemented by major companies like Conde Nast and Vodafone. With these tools, employers have no excuse for keeping men and women at separate and unequal pay scales. Gender parity is crucial to help all entrepreneurs, including female business leaders, create more agile and innovative growth opportunities. Emerging technologies will be a crucial driving force that helps women across all sectors achieve this equality. At the same time, major companies and society must hold each other accountable when we use technologies that reiterate gender bias. Now more than ever, we have an opportunity to create an equitable legacy so women aren’t struggling to keep up for another two centuries. It’s time to power up those devices so we can use them to empower everyone.